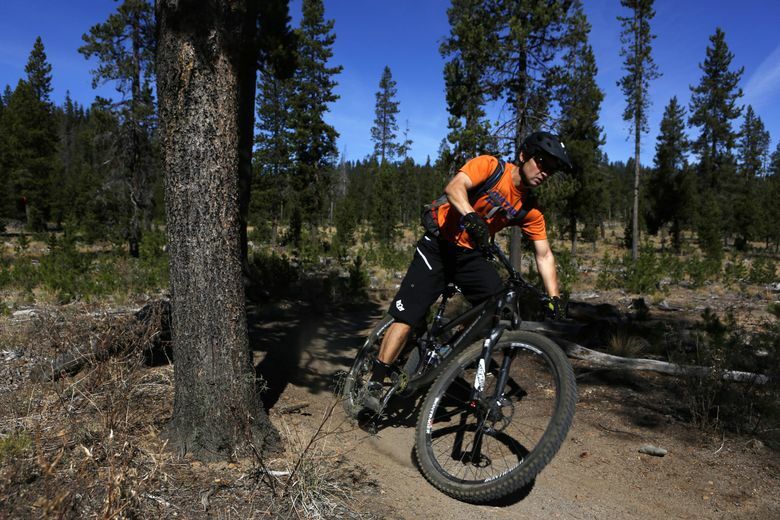 Growing trail systems near Bend benefit from damping down and cooler weather of fall. 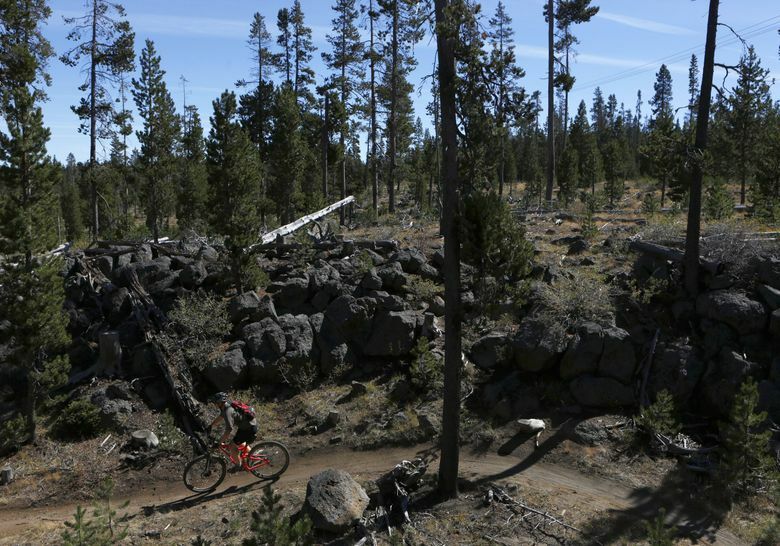 BEND, Ore. — The prime mountain-biking season is upon us in Central Oregon. Rainfall and cooler weather take those dusty single-track trails and pack them down into perfect shape for the fat-tire crowd. Hitting the trails on a clear, sunny day after significant rain the day or night before is the ideal time to go for a ride. One day before rain was forecast to finally drench the High Desert, I made a quick trip to bike some of the renowned single-track southwest of Bend. The trails remained dry and sandy, but even in subpar conditions, the trails in Central Oregon are almost always a blast. This is especially true for single-track that has been built in the last 10 years or so, including the Wanoga complex. As mountain bikes have evolved from cross-country design to more all-mountain (full-suspension with longer travel), trail design has followed suit. The Central Oregon Trail Alliance — a nonprofit, volunteer organization that builds and maintains trails throughout Central Oregon — is continuing to expand the Wanoga system, which now includes nearly 30 miles of trail southwest of Bend. The network lies just south of Century Drive and south of the already vast Phil’s Trail network. Many trails in the Wanoga system have technical features, which include man-made jumps, natural rock obstacles and bermed corners. The trails are the epitome of modern-day mountain biking: something for the younger, air-seeking generation, but tame enough for most spandex-clad cross-country folks. Funner and Tiddlywinks were the first two trails in the system, built in 2008 and 2009. It is hard to believe those trails have been there that long, as they seem so new and modern every time I ride them. Over the last six or seven years, COTA has designed and built numerous other state-of-the-art trails in the Wanoga complex, including Kiwa Butte, Larsen’s, Dinah-Moe-Humm, Tyler’s Traverse and Duodenum. If Tiddlywinks seems like a random name for a mountain bike trail, that’s because it is. Jeff Newman, a former trail steward for Tiddlywinks who helped build much of the original route, was looking for a name that would stand out, something different from Phil’s, Ben’s or Kent’s — popular trails west of Bend that are named after their founders. So instead of Jeff’s Trail, we have Tiddlywinks. Both Tiddlywinks and Funner connect to the Storm King Trail just south of Century Drive. I started the ride from a small parking area off Century Drive, near where Storm King crosses the road. For the loop, I prefer to climb Funner and ride Tiddlywinks back down, but the route can be ridden in either direction. Hike-a-bike is required on several of the steeper rock sections along the Funner climb. After about an hour of riding, I reached Wanoga Sno-Park and took a few laps on the pump track in the parking lot there. Tiddlywinks starts next to the restroom building at the snow-play area at Wanoga. I cruised through tight forest on tacky single-track, then through an open, logged area. Yellow “Y” signs indicate where the trail breaks into two separate single-track paths. These areas were built to serve as passing areas during races. Riders complain about doubletrack, but also that they are unable to pass others during a race on single-track. Passing lanes solve both problems. After continuing along a steep climb as the forest became thicker and thicker, I finally arrived at the junction with the Kiwa Butte Trail. There, riders have the option of climbing the Kiwa Butte path to the top of the Tyler’s Traverse Trail or flying down Tiddlywinks along a section highlighted by numerous boulders and other riding features. I chose the latter and soon thereafter arrived at a long section of man-made jumps and bermed corners. The riding was fast and furious, with lots of air time. The dust made it a little tricky, but rain and cooler temperatures will soon remedy that situation. Tiddlywinks is dotted with boulders built into the design of the trail. Many of the big rocks appear daunting on approach, but the drop-off is never severe, and riders can choose to either catch some air or ride the rock back down to the trail on the other side. Intermediate bikers can roll over the boulders fairly easily. At some of the bigger rock features, a trail option has been built so riders can take a smooth route around. I continued down, surging through banked turns and hopping over and down rocks. The 13-mile ride took about two hours, but I’ll be back for more soon, when ideal fall conditions will make the mountain biking even, uh, funner. Directions: From Bend, Ore., take Century Drive west about 10 miles. After a long straightaway and a chain-up area on the right, turn left into a small dirt parking area. Ride the single-track west, then take a left onto Storm King. Ride Funner up to Wanoga Sno-Park, and Tiddlywinks back down, or vice versa. Length: Loop is 13 miles. Rating: Technically intermediate to advanced and aerobically moderate. Trail features: Twisting single-track with plenty of intermediate downhill features (boulders, dirt jumps and banked turns) and “Y” sections for passing during races.